← It’s Always a “Sunny” Day at the Museum! American Studio Glass installation at the Milwaukee Art Museum. Photo by the author. 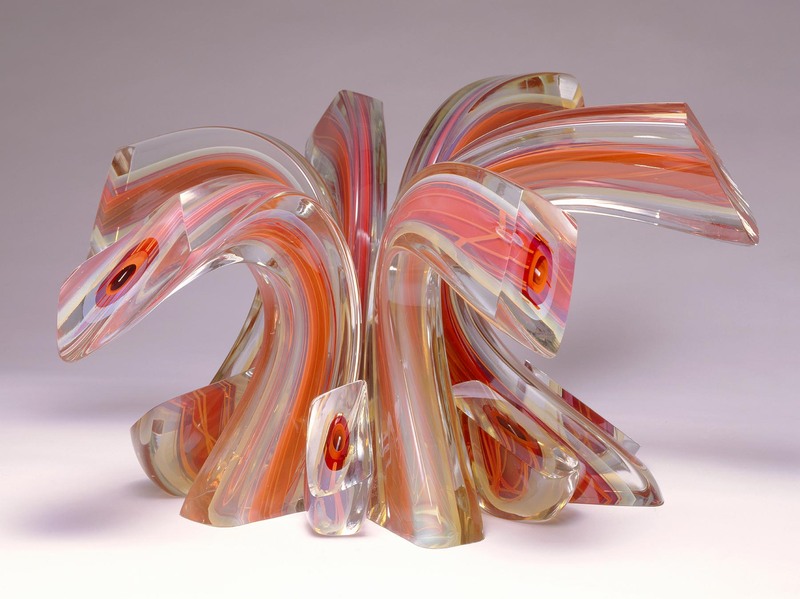 The year 2012 is considered the 50th anniversary of the American Studio Glass movement. The anniversary is being celebrated with exhibitions and events across the country, organized in large part by the Art Alliance for Contemporary Glass. 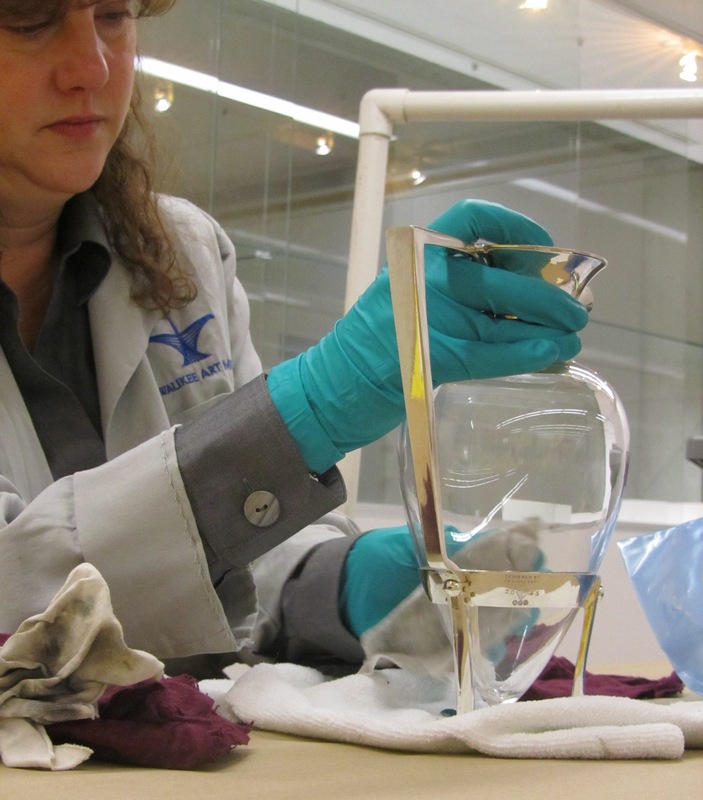 The Milwaukee Art Museum has a terrific collection of studio glass, and we were thrilled to be part of the celebration. Along one wall of the newly-designed Kohl’s Art Generation Studio is a new installation that celebrates using glass as a medium of creative impulse. The glass sparkles, tells an important art history story, and I hope that its visual beauty inspires young artists as they create their own artwork nearby. What is the American Studio Glass movement, and what is this anniversary? Harvey K. Littleton (American, b. 1922), Lemon/Red Crown, 1989. Blown and drawn glass, cut and polished, 15 3/4 x 28 1/4 x 31 in. Milwaukee Art Museum, Gift of Peter and Grace Friend, Mr. and Mrs. Wayne J. Roper, Laurence and Judy Eiseman, Dr. and Mrs. Jurgen Herrmann, Dr. and Mrs. Leander Jennings, Nita Soref, Marilyn and Orren Bradley, Mr. and Mrs. Frank J. Pelisek, Dr. and Mrs. Robert Mann, Burton C. and Charlotte Zucker, James Brachman, Mr. and Mrs. John F. Monroe, Mr. and Mrs. Donald Wiiken, Elmer L. Winter, Mr. and Mrs. Stuart Goldfarb, Mr. Ben W. Heineman, Mr. and Mrs. Norman Hyman, Janey and Douglas MacNeil, and Friends. Photo by Efraim Lev-er. © Harvey K. Littleton. Fifty years ago, in 1962, Wisconsin artist Harvey K. Littleton (American, b. 1922) and glass scientist Dominick Labino (American, 1910–1987) introduced glass as a medium for artistic expression in two workshops at the Toledo Museum of Art in Ohio. Littleton and Labino developed small furnaces and a glass formula with a low melting point, making it possible for individual artists to work with glass outside of an industrial setting. In 1963 Littleton taught the first glass-blowing class in an American college at the University of Wisconsin–Madison. This combination of events kick-started the American Studio Glass movement and introduced a generation of trained artists to glass as a medium for individual, creative expression. In other words, glass moved out of the factory and into artists’ studios. 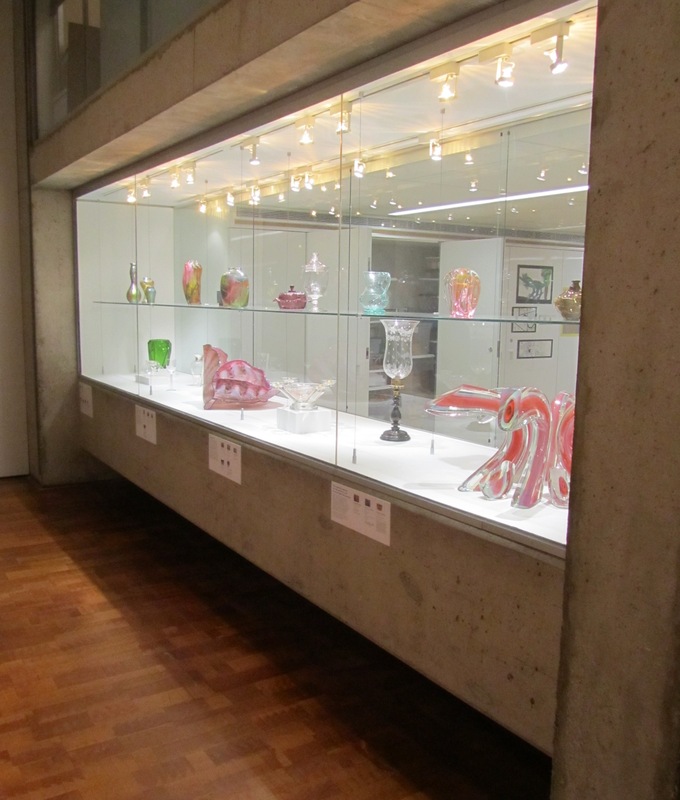 The Museum’s installation features glass by both Littleton (like the Lemon/Red Crown above) and Labino that shows how they created glass not for a functional purpose, but purely for beauty and expression in color, form, and optics. Fritz Dreisbach (American, b. 1941), Maternal, 1979. Blown glass, with multicolor inclusions, 11 1/2 x 5 x 4 3/4 in. Milwaukee Art Museum, Gift of the Sheldon M. Barnett Family M1991.2. Photo by Efraim Lev-er. The installation includes artwork by glass artists Dale Chihuly, Tom McGlauchlin, Fritz Dreisbach (at left), and Howard Ben Tré. These mostly abstract forms display the technical virtuosity of their makers and the optical beauty of glass. We see wild color, trapped air bubbles, and creative shapes that are simply beautiful, with no mind toward utility. 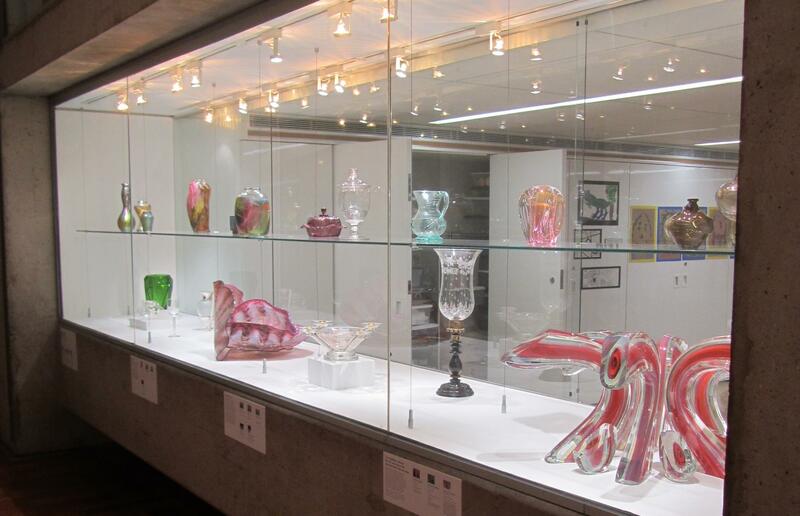 To give a contrast to the creative advancement in the American Studio Glass movement, the installation also includes glass objects that are primarily functional rather than creative (even if they are decorative and beautiful). A pressed glass covered dish, lamp, and a gorgeous “lily pad” pitcher show the practical applications of glass, a medium that has been embraced for 3,500 years for its transparency and delicate appearance. Glass windows let sunlight enter a room. Glass lampshades protect a flame while letting the light shine through. Glass containers keep liquids safe without affecting taste. While there is no substitution for viewing this artwork in person, the Art Alliance for Contemporary Glass has shared some wonderful videos of artists making and speaking about their glass work, including Pioneers of Studio Glass, a video produced by AACG to commemorate the 50th anniversary of contemporary studio glass in the United States. And then, of course, you can see the fires and kilns and molten glass that we are unable to experience in Museum galleries! 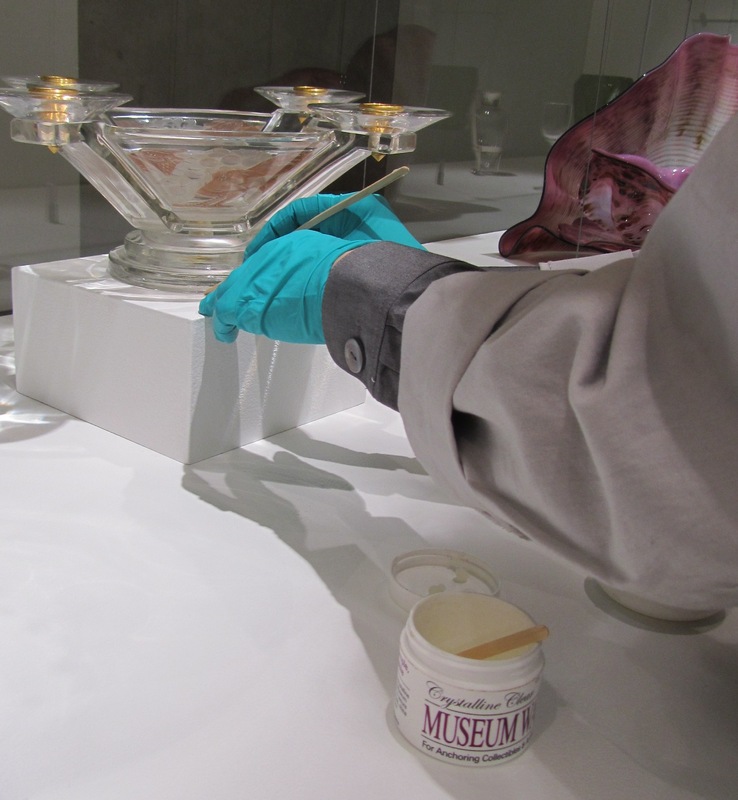 For the benefit of our Blog readers, during the installation of the glass I snapped a few pictures that show details of the artwork and the care of our art conservation and technician team. 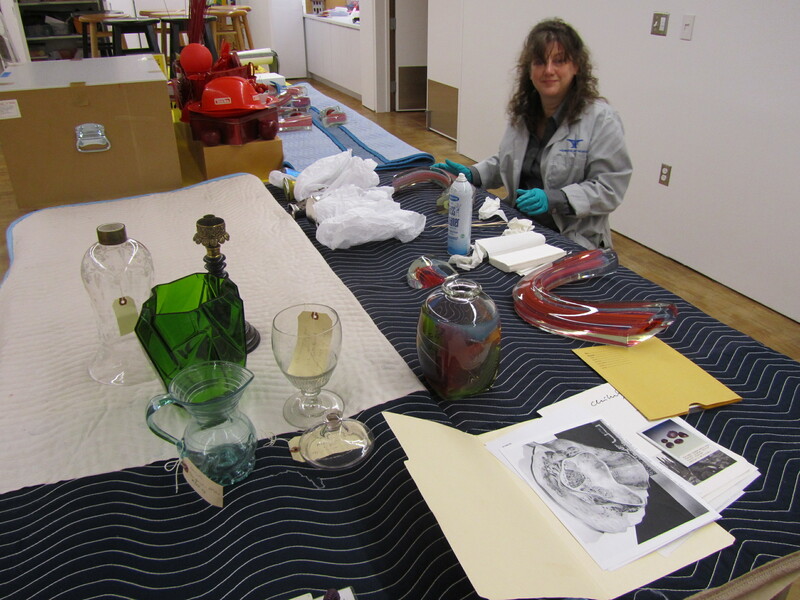 Museum staff working on the American Studio Glass installation. Photo by the author. 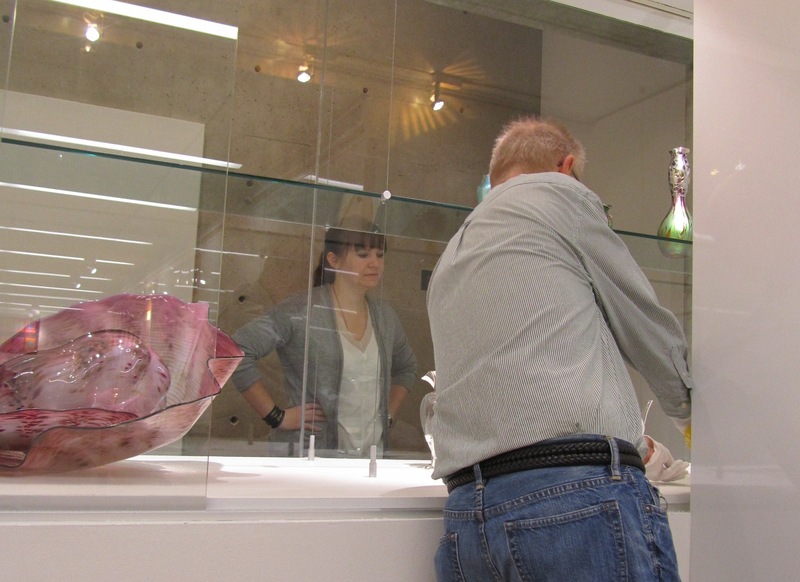 Museum staff working on American Studio Glass installation. Photo by the author. 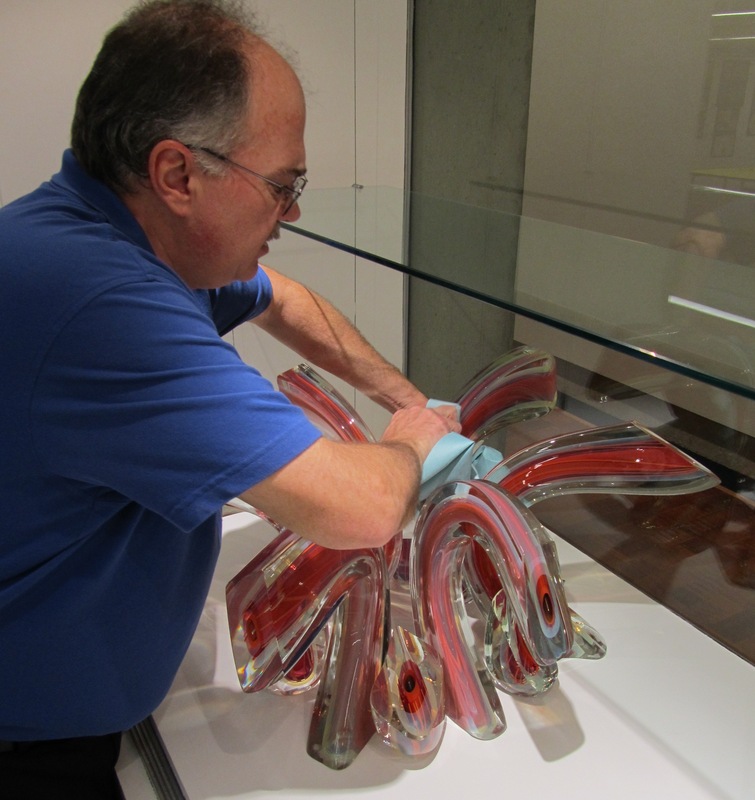 Museum staff working on the American Studio Glass installation. Photo by Terri White. American Studio Glass installation. Photo by the author. Thanks to graphic designer Sierra Kortoff and design intern Nate Pyper for devising great little labels that include images of all the objects! This entry was posted in Art, Behind the Scenes, Curatorial and tagged 20th century art, American Art, Art Alliance for Contemporary Glass, Art Installation, Behind the Scenes, conservation, Dale Chihuly, Decorative Arts, Design, Dominick Labino, Fritz Dreisbach, glass, Harvey K. Littleton, Howard Ben Tre, Installation, Kohl's Art Generation, Tom McGlauchlin, wisconsin. Bookmark the permalink. Thanks for this post, Mel–I can’t see a glass installation without wondering about the details of how it comes together. And I love that the families making art in the Kohl’s Art Generation Studio have these beautiful, fragile pieces in their midst! I agree that it is such a fun opportunity, as we’ve done with several of the Kohl’s Art Generation projects, to have Museum Collection material right on hand for inspiration.